When is a chore not a chore? When you see results that will last. A good spring-cleaning plan will take care of your home and deliver results that keep you feeling good about your space for a long time. The trick is to have an organized plan, pick the right tasks, and tackle them with the right supplies. Step one? Check out the tips below! Gloves. Regular use of harsh chemicals when cleaning can damage your skin and nails over time, so a good pair of rubber gloves is a must! Rags and brushes. Depending on what you’re using it for, you may want different types, such as tough bristles for kitchen and bathroom scrubbing but rags for softer surfaces. You can repurpose old towels into rags instead of buying new. Broom and dustpan. When cleaning your tile or linoleum floors, sweep first before washing. A good sponge mop with a squeeze handle and a bucket large enough to hold water without spilling. An extendable duster for dusting areas like walls and around windows. Swiffer. Or some type of electrostatic fabric to attract the dust on wood or vinyl plank flooring. Of course, to put all these tools to use, you’ll need cleaning products. Think of the different elements and rooms in your home to make a list. For example, you’ll need the right type of cleaner for each type of flooring and a spray for cleaning windows. In the kitchen you’ll want soap for counters and special product for stovetop; in the bathroom, a toilet bowl cleaner, shower/tub cleaner, and drain cleaner will come in handy. Alternatively, you may want to consider green cleaning supplies for multiple tasks in your home. Your main ingredients will be white vinegar, baking soda, and lemon juice. With these on hand, you can make your own mixtures to green clean your home! Start by touring your home and making note of big projects that need to be tackled. These are things that you can fit into your schedule when you have a little more time to spare, or you may want to hire help. For instance, this year might be the spring you need professional carpet cleaners to come in. Washing/dusting. This starts from the ground up – from flooring, counters, windows and walls, to light fixtures and fans. Everything can use a good wipe down. A thorough bathroom clean is another necessity, so be prepared to get scrubbing (toilets, showers, and sinks) and maybe even clearing out drains. De-cluttering. Follow nature’s springtime lead and push away the old in order to make room for the new. It should be your first task every spring to take stock of what you have just lying around the house and either find a new purpose or new home for items you no longer need or use. Cleaning ducts and vents. You might even think about getting your air ducts/air conditioning/ventilation systems/furnace system looked at by a professional. It’s not very costly and it’s important to know there hasn’t been any mould or mildew buildup over the winter; a cleaning and recalibration are always beneficial to keep the air in your home healthy. Minor repairs. This may not exactly be “cleaning” but it is part of maintaining your home and it’s likely easier to address this issues while you’re already sprucing up your home. Research how you can fix little things like a loose doorknob if you don’t already know. Can’t do it? Hire a handyman. It’ll be worth it for the peace of mind. So, you’re stocked up on supplies and you know what needs to get done – but where to start? Starting at the top and working your way down helps you avoid getting what you just cleaned dirty again. For example, clean those dusty overhead fan blades first and when you’re done, then you can vacuum it up from the carpet and dust the wooden furniture. Beginning at the centre of the house and working in widening circles increases efficiency. Pick a room, and then start vacuuming or even shampooing the rugs if needed. When that’s done, clean the clutter off the shelves, dust and polish the woodwork. After that, you can clean out the closets or wash the windows if necessary. Doing two things at once can speed up the process. 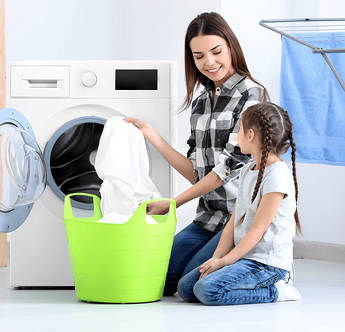 Tackling the laundry while cleaning the bathrooms can make you feel like the spring cleaning is getting done twice as fast. Cleaning out the kitchen cabinets while you’re waiting for the oven cleaner to foam up is another neat trick. Just don’t try to do too much at once or you may get bogged down. If you have children, they can pitch in! When you get to the kids’ bedrooms, enlist their help in picking up games and toys and putting them back on the shelf. Showing them how to organize their rooms and throw out what they no longer want teaches them valuable skills, and it lightens your spring cleaning load. This can give you guidelines, but everyone approaches tasks in their own way. Understand your personal style and plan accordingly. For example, you may decide to dedicate an hour after dinner every day for a week to take on one room at a time; or, you may prefer to set aside a weekend and get it done all in one shot. You’ll clean best if you’re doing so on a schedule that fits with your lifestyle. Spring seems more refreshing when you have your own home, but more space doesn’t necessarily mean endless scrubbing and cleaning chores. 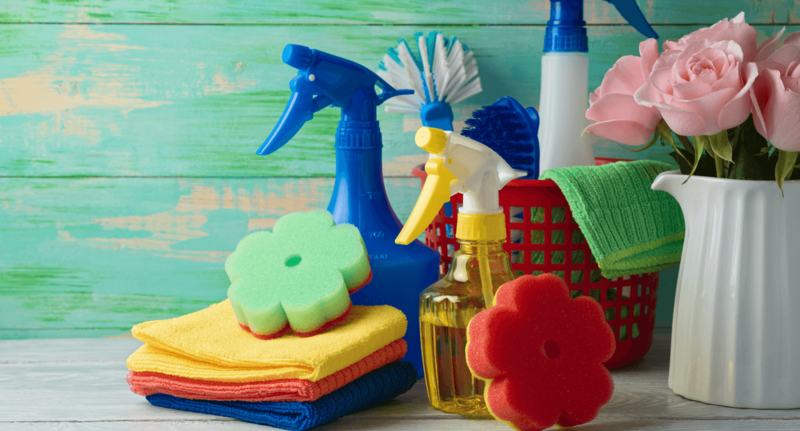 Remembering these handy tips can make spring cleaning less like housework. Then, when your house is sparkling and fresh-smelling, go out and enjoy the weather! Wishing you could speed up the process? These spring cleaning home hacks may become your new favourite tricks. *Originally posted Mar 17, 2015, updated April 3, 2018.